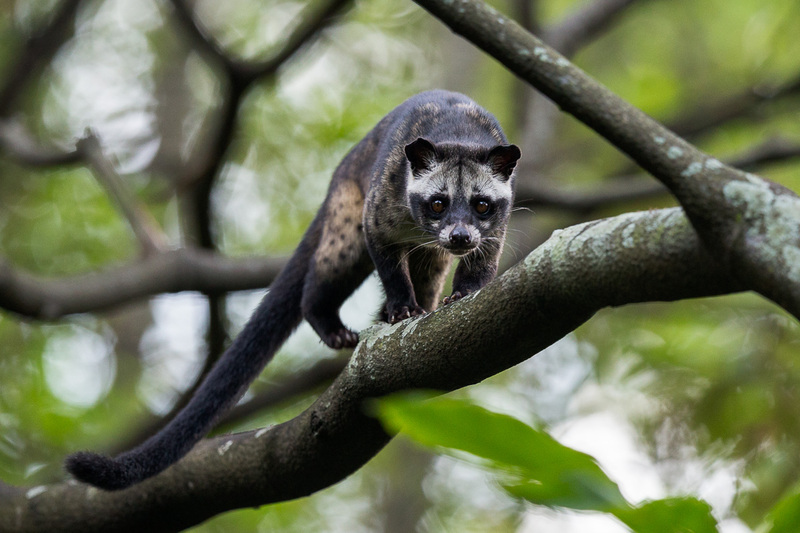 Asian Palm Civet (Paradoxurus hermaphroditus), also called toddy cat in English, and musang in Malaysia/Indonesia and sometimes luwak in the latter. It is a nocturnal animal, that is good climber. It feeds on fruits mainly but occasionally eats smaller mammals and insects. It also feeds on palm flower sap which when fermented becomes toddy, hence the alternate English name. It is the same animal that is the source of Kopi Luwak, or civet coffee, one of the world’s most expensive coffee. Made from the beans of coffee berries which have been eaten by the animal, then passed through its digestive tract. 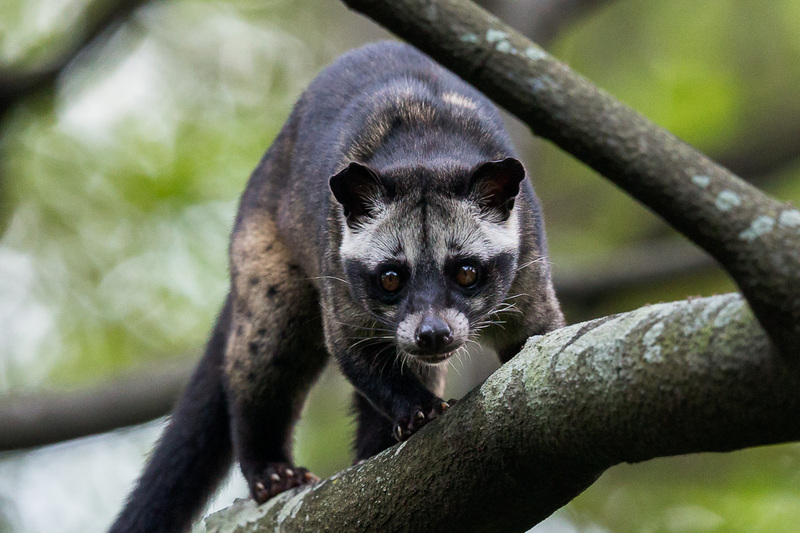 It is the commercial production of this type of coffee that threatens the wild population of civets as increasing number are captured and ‘farmed’ for the coffee beans. 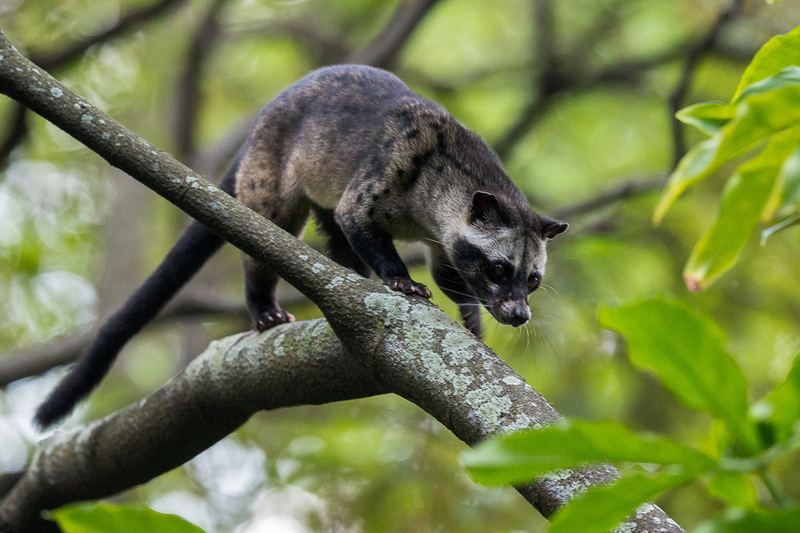 In Singapore, civets can be found in forested areas of Singapore and also near urban areas, especially the Siglap area. This particular civet was found at the former Bidadari Muslim cemetery at dusk in October 2012. It was probably the start of it’s evening food round. Upon contact with with human, it quickly ran up a tree where it stayed around for a few moments before quickly disappearing into surrounding vegetation. This entry was posted in Mammals, Wildlife and tagged Bidadari, Civet, Luwak, toddycat on May 31, 2014 by Francis Yap.